Ana Prada came to Anamaya for a second time, this time to do a small retreat and series of classes teaching aerial silk acrobatics, also known simply as “tela” in Spanish, which simply means “fabric”. Ana is Colombian, but lives in Montreal, Canada, and has strong ties to Costa Rica because she has family here. One of her friends works as Cafe Organico in Montezuma, which is how she found out about Anamaya. Once she saw our place, she was very excited to have some classes and events here, so after a day class last February, in which many of the owners and staff of Anamaya participated, she decided to hold a full retreat. She had one or two classes per day, with a variety of student skill levels. 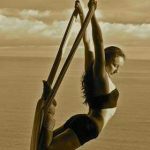 Some were total beginners, and others, such as Francesca who lives in Malpais, are teachers of silk acrobatics themselves. Everyone had lots to learn from Ana. Her classes started out with stretching and yoga, and included some pilates exercises to warm up the shoulders. Utilizing stretchy, rubbery fabric strips that Ana brought with her, we did repetitive small rotations and flexes, which at first seemed ridiculously easy, but after doing twenty of them in multiple directions, were very effective at warming up the insides of the joints, tendons, and ligaments. Of course this was to help prevent should injuries when practicing various moves and tricks on the silk. In addition to the silk that we have hanging in the main hall at all times at Anamaya, we set up two others on the view/yoga deck and one by the pool, so we had plenty of silk for the students, who took turns and rested between sessions. On Friday night, we had a big party and invited the community. Local Italian DJ, Ferdinando “Mr Black” set up on the balcony overlooking the main hall, since that night the master suite was unoccupied. We had Anamaya’s usual spectacular dinner, where we set a new record by serving 26 people at once. After that, the students each performed, with Ana performing last. That was followed immediately by the fire dancing. I started with fire eating in the main hall, and led the audience outside to where we had the show in the grass. Ileana was the only one who performed in both shows. The party went until 1:30am, and we were lucky because all the guests at Anamaya were in a festive mind-set and didn’t mind. Overall, the retreat and silk classes went very well and everyone had a great time. Ana is already planning her next retreat, and has even greater interest after people saw the photos and aerial silk retreat video from this one.